This festival proves that we still love him tender. Parkes Mayor Ken Keith getting into the Elvis spirit at the Parkes Elvis Festival. Sydney's Central Station was all shook up this morning as hundreds of Presley fans boarded the Elvis Express. The train will take a seven-hour trip to the town of Parkes where the annual Elvis Presley Festival will celebrate the life and music of the King. The tickets for this special trip sold out in hours way back in September 2016. Travellers were treated to Elvis-tastic tribute performances before and during the rail trip. "From humble beginnings eleven years ago when we had 16 fans aboard, this year we will welcome almost 400 dedicated followers of the King to start their festival party before leaving Sydney," NSW TrainLink Chief Executive Rob Mason said. The Elvis Presley Festival is in its 25th year and is running with the theme 'Viva Las Vegas'. The festival is predicted to be bigger than ever with up to 25,000 people expected to rock and roll in Parkes from 11th to 15th January. The idea for the Elvis festival came about in 1993 at a birthday party in a restaurant organised by keen Elvis fans, including a man who changed his name to Elvis via deed poll. Geography professors Chris Gibson and John Connell have co-authored a book about the phenomenon called 'Outback Elvis' which will be launched at the festival tomorrow. Between them, they have attended every Elvis Festival for the last 15 years. "There was a couple called Anne and Bob Steel and they ran a restaurant in Parkes that they named Gracelands after Elvis Presley's mansion in Memphis," Gibson told The Huffington Post Australia. "They were having a birthday party for the editor of the local newspaper, The Champion-Post, who was also an Elvis fan so at the end of the party they opened a bottle of red wine and said at the table 'Wouldn't it be a neat idea to actually have a festival for it as a celebration of Elvis on his birthday in January?' And that's how it began really." 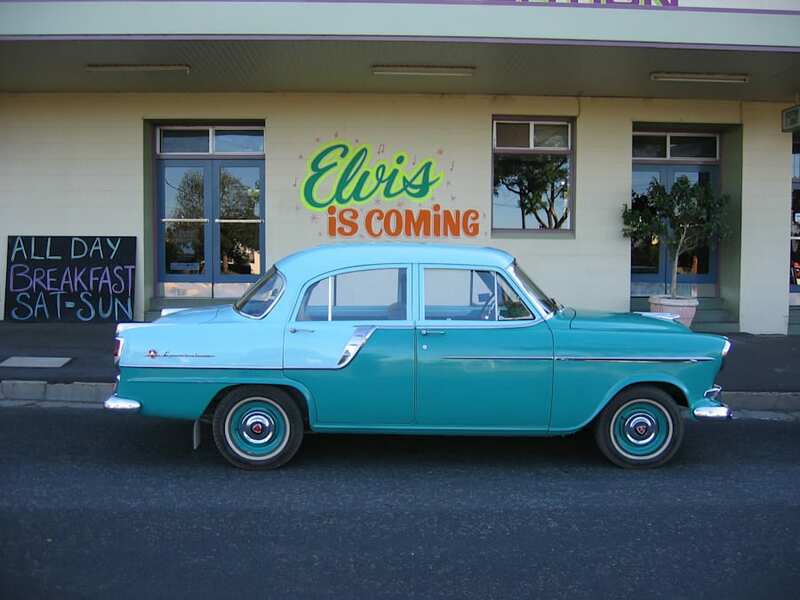 The Elvis Festival is Parkes' biggest annual tourism event. Local railway worker Steve Lennox was the winner of the first Elvis lookalike competition in an impressive tailor-made Elvis suit made by his wife Debbie. "Forevermore, when he walked down the main street of Parkes to get a newspaper or a bottle of milk, everyone would shout 'G'day Elvis' and it stuck. So he changed his name by deed poll to Elvis," Gibson said. Elvis Lennox now has one of the largest collections of Elvis memorabilia in his garage which he opens every year during the festival as a museum. 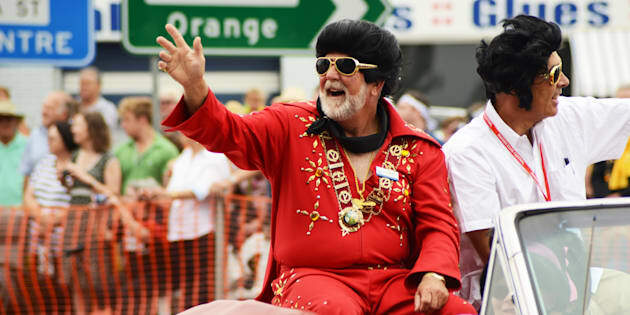 From its humble beginnings as a small town parade to today's five day extravaganza of Elvis, the festival is now the largest annual tourism event in Parkes. It's now so popular that some hotels are booked out during the second weekend in January for the next five years -- there are even rumours that some people have booked their room for the festival until they die. So what keeps people coming back? "It is true I think that there are a demographic of people who were teenagers themselves or kids when Elvis was alive and singing. I think it is a chance to relive their youth and reconnect with the music," Gibson told Huffpost. "Elvis stood for quite a rebellious revolution in popular culture really. He ushered in rock and roll as a mainstream thing and for teenagers at the time he stood for everything you wanted to do as a teenager in the 1950s, like rebel against your parents." "There are also younger people that come to the festival too. There's been a revival of 1950s culture; rockabilly music and dancing and clothes are very popular." Swarms of people dressed as Elvis will once again take over the town of Parkes to enjoy over 120 free and ticketed events, shows, concerts and competitions. But the question is, what do you call a group of Elvises? Elvi?